WordPress now feels like a sect, where it thinks it can totally ignore its users. 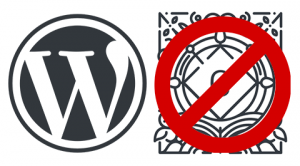 Here are ways to deny WordPress updating to version 5 Gutenberg. While changing the url for logging in to a WordPress site is only a tiny measure to step up security, and it surely should not be the only one to secure a website, we think every little bit helps. It’s not enough to simply put the code used for a template file within a shortcode function. It will not work. We explain how to add a front-end ACF form the right way. With just a little code you can load Elementor’s font-awesome styles from a Content Delivery Network (CDN) instead of from the plug-in directory. Sorting of Portfolio Filter Bar is standard set to alphabetical. There’s no option for alternatives. With a simple change you can alter the ordering. In WordPress, you can easily get custom taxonomy terms that belong to the current post. However, it’s not so obvious how to get your current post’s terms in hierarchical order, including links to the term. But it is possible and we explain you how. In the free version of this plugin, on your overview page you can only get the “full content” of a blog or news post or the first X number of words of the post, not the manual excerpt you can set in a post edit. Well, that’s very easy to customize. WordPress introduced emojicons in version 4.2 of the popular Content Management System (CMS). To be honest, we don’t understand why they did that. To disable emojicons in WordPress is simple. CamboDesign explains how to do it. If you have a multi-lingual website, it’s not so clear how to get separate sitemaps for each language, when your different languages are in subfolders (e.g. mywebsite.com/en/ and mywebsite.com/fr/). Here we explain how you can achieve this by adding a simple code to your functions.php file. Have you ever felt the need to disable certain dates/times within the date-picker of Gravity Forms? You cannot do that in the back-end. There are some plugins promising that, but usually only allow you to restrict the range to fixed dates. That’s not very useful when you want to restrict e.g. to today and 1 year ahead. Here are two easy solutions that work.